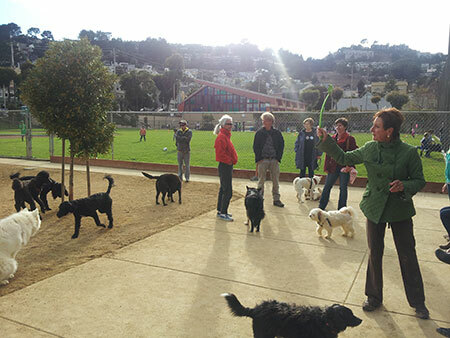 Friends of Upper Noe Dog Owners Group (FUNDOG) is an active group of neighbors of all ages who care deeply about our community, responsible dog guardianship and fostering a safe and friendly neighborhood environment for people and pets to interact. Join FUNDOG to lend moral and political support to efforts to better manage and maintain this space for the benefit of our four-legged friends, ourselves and our community. 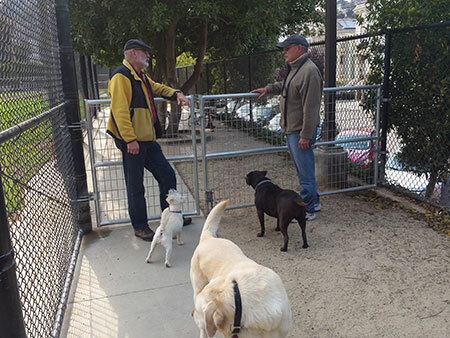 Neighbors chat over the recently installed gates in Joby's Run. The gates can swing all the way open and out of the way to provide options.